Biden Visits Chinese Leader As Flight Zone Dispute Simmers : The Two-Way A closed-door session between Vice President Joe Biden and President Xi Jinping that had been scheduled for 45 minutes stretched to two hours. Vice President Joe Biden speaks after a welcoming ceremony at the Great Hall of the People in Beijing Wednesday. 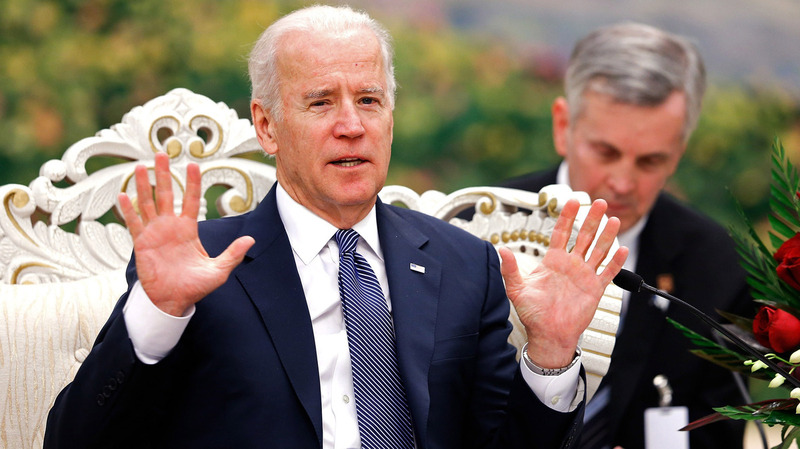 Biden met with China's president to discuss issues that include China's recent claim of an air defense zone. Vice President Joe Biden met with China's president in Beijing Wednesday, in a trip to Asia that has often touched on growing tensions over China's new air defense identification zone. Biden's two-day visit to China was planned before the country's defense officials surprised neighboring Japan by declaring a defense zone in an area contested by the two countries. The topic of the air zone likely helped extend a closed-door session that had been scheduled for 45 minutes to its actual length of two hours. "At the U.S. embassy here, Biden enthusiastically challenged Chinese visa applicants to think outside the box and challenge their own government. Chinese may find his remarks inflammatory," NPR's Anthony Kuhn reports from Beijing. "Hours later, though, Biden sounded hoarse as he spoke to President Xi Jinping about the need for trust between Beijing and Washington." In public remarks in the Great Hall of the People that were separate from their closed meeting, Biden said, "As we've discussed in the past, this new model of major country cooperation ultimately has to be based on trust and a positive notion about the motive of one another." After China's declared its control over the airspace, the U.S., Japan, and South Korea have said that they do not recognize the claim. Within days, several aircraft — including two U.S. bombers — defied China's requirement that all planes identify themselves. As we reported yesterday, Biden said during a visit to Japan that the U.S. is "deeply concerned" about the air defense zone.